Postponements ashore and afloat turned into a final conclusion of no wind, no play on race day 3 at the 2016 420/470 Junior Europeans on Lake Balaton. Race 6 for the 470 Men and Women got underway, but massive wind shifts forced the Race Committee to abandon. Light wind is again forecast for Wednesday 3 August, but being optimistic the Race Committee has scheduled three races for all fleet. So no change in the leaderboard standings. Video highlights from race day 3. The 49 boat 470 Men fleet advanced to final series racing with 25 teams in gold and 24 in silver, headlined by Malte Winkel/Matti Cipra (GER) on tiebreak over Italy’s Giacomo Ferrari/Giulio Calabro. Spanish twin brothers, David Charles/Alex Charles are in third. Postponements ashore and afloat, transitioned to breeze and the first race of final series racing got underway mid-afternoon. Despite the race subsequently being abandoned due to a wind shift and fading breeze, a confidence boost for Turkey’s Halil Demirel/FiratSahin who seized a cracking start and led the fleet to the first mark. The partnership has produced a noticeable shift in form this year, and have the capacity to climb up the leaderboard. Three races are scheduled for gold and silver fleet racing on Wednesday. Points are tight all the way through the 470 Women leaderboard, which has been headlined since day one by Italy’s Benedetta Di Salle/Alessandra Dubbini. Joining the more experienced teams are several faces making their first appearance at a 470 Championship, including Australia’s Nia Jerwood/Monique De Vries. The Australians have split their time between the 420 and 470, last month racing the 420 Worlds where they finished mid-fleet. A big turn-around so far in their 470 performance on Lake Balaton, compared to the 420 Worlds in Sanremo. “It was very light wind at the 420 Worlds and our strength is definitely in the heavier breeze, but we are learning so much from doing both. At home we have been doing a lot of training in both classes, racing in the 420 and training in the 470. We are definitely feeling a lot more confident and comfortable in the 470 at the moment, as we have done more training,” reflected Jerwood. Joining the Australians in making their first 470 Championship appearance are last year’s 420 World Champions Marta Garrido/Maria Jesus Davila from Spain. Content with a more humble appearance at the back of the fleet, they recognize the steep learning curve ahead. “We have only done about three races this year, and the level has been really high in Spain due to the Olympic selection,” commented Garrido, referring to the intensity of competition between the many teams hunting down Spain’s ticket to the Olympics. “I like the 470 as we are learning many things, but you need to train double compared to the 420 and it is more physical. We enjoy that. It is like a new goal for us,” said Davila. “When we come to racing we are getting a really good level, as everyone is 100% and we learn from that. It is very professional,” she concluded. From the newbies in the fleet, to the established teams at the front, where only 14 points separate the top 10. Three races on Wednesday will mark a defining day. Switzerland’s Maxime Bachelin/Arno De Planta hold the points advantage at the front of the eighty-three boat 420 open fleet, but with only 11 points separating the top 5 teams, this Championship is still wide open. The battle for glory resumes on Wednesday, with three races scheduled. Intent on climbing higher up the leader board are third placed Ido Bilik/Ofek Shalgi from Israel. This partnership won the first ever U17 420 Junior European Championship last year in Bulgaria, and made their first Championship appearance in the 420 Open fleet at last month’s 420 Worlds. Their 14th place performance was not what they had planned, as the light winds early in the 420 World Championship series meant they only made an appearance at the front of the pack towards the end of the week, when the wind increased. They are on a mission of redemption, and no surprise to see them consistently knocking out top ten finishes here on the surprisingly windy, until today, Lake Balaton. “We liked the stronger winds yesterday and we sailed fast I think, which helped us," said Bilik. 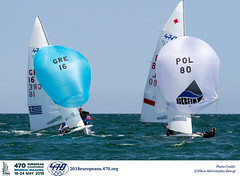 “At the 420 Worlds our results were not good in the first three races. We then improved but it was too late." Racking up experience has been crucial to their performance gain, and the pair couldn’t resist the allure of competing against the world’s top Olympic sailors and soaking up knowledge, when the 470 Worlds arrived in their home waters in October last year. “It was amazing. We were very excited every day and we didn’t care about the results, we cared about our learning," reminisced Bilik. “That experience really helped us with our downwind boat speed, and we also learned how to take better control of the starts, which were really hard at the 470 Worlds. That has shown in our results here," he concluded. Another team making 420 Class history last year were Italy’s Edoardo Ferraro/Francesco Orlando, who won the first ever U17 420 World Championship title in Japan. They finished 15th at the 2016 420 Worlds, just behind Bilik/Shalgi, and started strong here on Lake Balaton by winning the opening race. Finding consistency however seems to be their nemesis, as their scorecard seesaws between top 5 results and double digit finishes, placing them in 8th overall. These are two of the many teams here who can mount a credible bid for a podium finish. Three races on Wednesday will put the pressure on everyone. Establishing themselves in the U17 fleet are 420 newbies, Vita Heathcote/Milly Boyle (GBR), in third overall. Whilst they have a points mountain to climb to catch the series leaders, first placed Tommaso Cilli/Bruno Mantero (ITA) and second placed Daniel Göttlich/Linus Klasen (GER), this young British pair has proven themselves as contenders, and most importantly are enjoying their moment inside the top three. 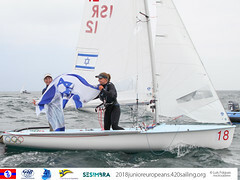 Both former Optimist sailors, with appearances at Optimist Worlds and Europeans to their credit, they are well used to elite level Championships. Now, heads together in one boat is suiting them. “Milly is so used to steering, so we are both trying to adapt,” explained Heathcote. “But it is really good to have two heads together to make decisions." On their performance so far, “We did the 420 Ladies Worlds and didn’t do so well," Heathcote said in reference to their 38th place in Italy. 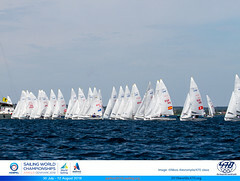 "Here sailing in the U17 fleet is great. We are pretty pacey upwind which is cool, but you really have to read the shifts here." “I love crewing, it is so much fun,” chipped in Boyle on her transition to two-person sailing. “It was really weird at first, not steering, but you get over that quite quickly. We have been really excited going into 420s and really eager to get learning. We had heard so much about 420 sailing and our friends told us how good it was. We couldn’t wait to move into the class and we love it. We are really good friends, so it was really cool moving into the boat together." Boyle continued, “We felt really young when we moved into the 420, but now we have settled in a bit. Now, being here and seeing all the 470s and seeing the next boat along, we are already starting to think about that too for our future." Heathcote has no dobut been inspired by her uncle, two-time Olympian and two-time Olympic silver medallist in the 470 Class, Nick Rogers. Commenting on how his guidance has helped, Heathcote said, “Nick and our coach have done a lot of mental strategy with us. Sometimes we go for briefings with him, before or after events, and he has come out on the water a few times and taught us some cool things." Onwards and upwards for this talented young pair. Go watch video highlights from race day 2. Three races scheduled for the 420 fleets on Wednesday 3 August, with an 09.55 first warning signal. 420 Open Gold fleet will start first, then 420 Open Silver, followed by U17. The 470 Class also have 3 races on their schedule, with the 470 Gold fleet starting first on a 09:55 warning signal, then 470 Women and 470 Silver.